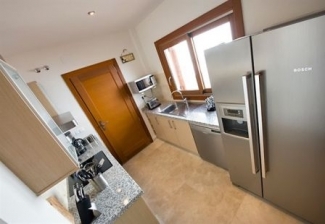 Villa Nova is a stunning Polaris World El Valle Resort 3 bedroom Frontline Golf Villa. A very bright and airy villa with private pool and views onto the mountains as a backdrop. A lovely 2 bedroom second floor apartment, sleeping 4/6 persons, viewing onto the golf course and fairway. Microwave oven, oven, hob, American fridge-freezer ( toaster, kettle and dishwasher). 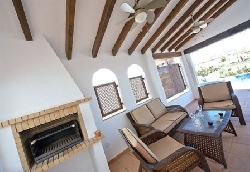 The villa comes fully equipped with full air conditioning in all rooms for the summer and central heating for the winter months. A highchair is available. The perfect location for the serious golf enthusiast with some of the best golf in Spain. With a choice of 3 Jack Nicklaus Golf courses all within easy reach. San Javier Airport is a 15 min drive. Alicante Airport is a 60 min drive. Murcia City is 15 min drive. Beautiful beaches of Mar Menor 20 mins drive. As a guest you will have unlimited access to the golf and facilities on this and all other Polaris World Resorts.